This is the 2nd of the 3 series of advocacy orientation on Enhanced K+12 Basic Education Program of the Department of Education in La Carlota. 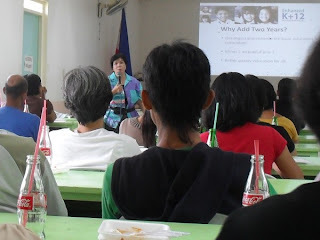 The officers of school governing council and of the federation parent-teachers association of the various schools in the division of La Carlota City attended this gathering at the conference hall of the division, yesterday (February 28, 2011). The orientation is focused on the K+12 which is a basic education program of the DepED to remedy the current problems of the education system of the country. According to statistics as presented by the Schools Division Superintendent Juliet A. Jeruta, the Philippines is the only country in the Asia in which the extent of basic education preparation is 10 years. Most of the Asian countries have it for 12 years. In so doing, it triggers poor quality education, congested curriculum; graduates are not ready for the world of work. Thus, they are not globally competitive. Juliet A. Jeruta apprised the SGC and PTA Federation officers on the importance of “togetherness.” According to her, coming to together is a beginning. Talking and discussing together is a progress and working together is success. She said the division of La Carlota is advocating the said program to “universalize” K-12 to all schools. It wants the children to be happy. Therefore this approach will focus on “kinder education” – education for all 5 years old. These kids are the initial pupils for the enhanced K+12 basic education program for school year 2011-2012. If they continue and complete their schooling until 2022, they are the first product of this program. We hope that they could make it. Anyway, SDS Jeruta is optimistic that this program will reap the fruits of the educators’ toils, sacrifices and efforts. As a teacher and educator, she is confident that solutions could be reached. Kindergarten curriculum covers the holistic development of the child like cognitive, physical, emotional, spiritual and social. She has informed everyone that all nearing 5 years old children should be in school this June 2011-2012 to attend the kinder education. And those who are 6 years old but not able to attend preschool class should enroll in summer kinder education classes in the 23 elementary schools in La Carlota City. Joey Velasco’s “Sa Kambas ng Lipunan” – a video presentation depicting the various children in the society, and partake the Lord’s last supper concluded the morning session. It has emotionally touched and moved everyone to commit himself/herself to support the program for a quality education for all Filipino children. (Joey Velasco passed away July 20, 2010 of kidney cancer). The morning session was attended by District I and II officers of SGC and PTA federation. The afternoon session is attended by District III and the secondary.